Yesterday was Lexi’s first day of Kindergarten. Thankfully, she had a much less traumatic first day of school than I did. Last week we went to the open house and met her teacher and got to go on a school bus ride. She was shy and nervous and I had to push her on to the bus. 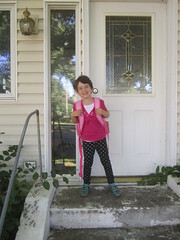 Made me a little worried for the first day of school, but when she came bounding up the stairs at 7 a.m., fully dressed and shouting, “Happytuesdayitsthefirstdayofschool!”, I knew it was going to be OK. 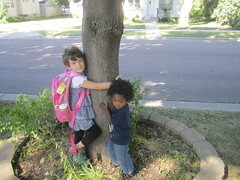 When the school bus came to pick her up she jumped and down and shouted, “There’s my bus!” Then Milo erupted in tears. In the afternoon she hopped off the bus with a big smile and gave me a high five. School was great. Awesome. The days of my children telling me nothing happened at school have already begun. Later in the day she told me I can’t wait for her at the bus stop. She’s going to wait by herself. Milo and I can watch out the window. Thankfully she’d forgotten that plan by this morning. She was playing outside with Milo a full 20 minutes before her bus was supposed to come, eager and ready to go. She asked me to take some more pictures, because apparently you need second day of school pictures. I went through the first day of school last year with Yeshumnesh, but this year was different. Yeshumnesh wouldn’t let me help. She wouldn’t confide in me, she wouldn’t turn to me with questions. And she’d also done it before. She wasn’t a little kid anymore, and while she was likely scared and overwhelmed, she also wasn’t going to show it. Lexi, on the other hand, could still be that little kid who would hug her dad before getting on the school bus. As excited as Lexi is to go to school, I’m pretty excited to send her. And not just because it means I get a few quiet hours when she’s gone and Milo’s napping. I’m excited because she’s so ready for school. She’s eager to learn. She’s just a sponge ready to soak up knowledge. And she’s also ready to do things by herself and have her own experiences. It’s a little overwhelming for me to have that starting now, but that’s how these things work. Your kids have to grow up some day and be their own person, and it starts a lot earlier than you think. At least for now she’s still asking me to take pictures.